The four-star Hotel Carlton Lyon MGallery by Sofitel welcomes you to the heart of Lyons' Presqu'île. Let yourself be seduced by this timeless retreat, popular with artists. The Hotel Carlton is a haven of tranquility in a bustling city. With an intimate bar and 80 cozy rooms, it is the perfect place for relaxation and serenity. Place des Terreaux, Place Bellecour, Old Lyons, shops, gourmet restaurants or bouchons, museums, the Opera, theaters... Enjoy everything that Lyons has to offer, only a few minutes on foot from the hotel. 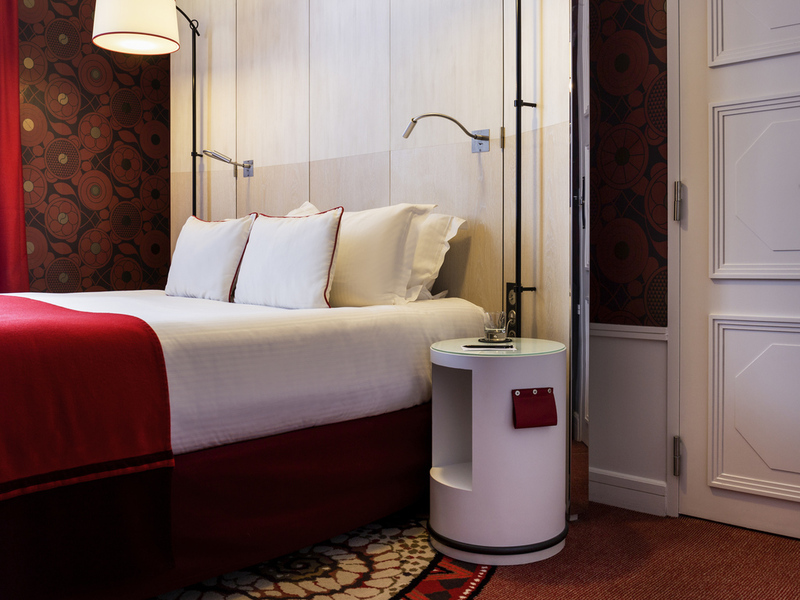 Stay in one of the suites, where the big names in cinema once set down their suitcases, and admire the view of Place de la Republique! 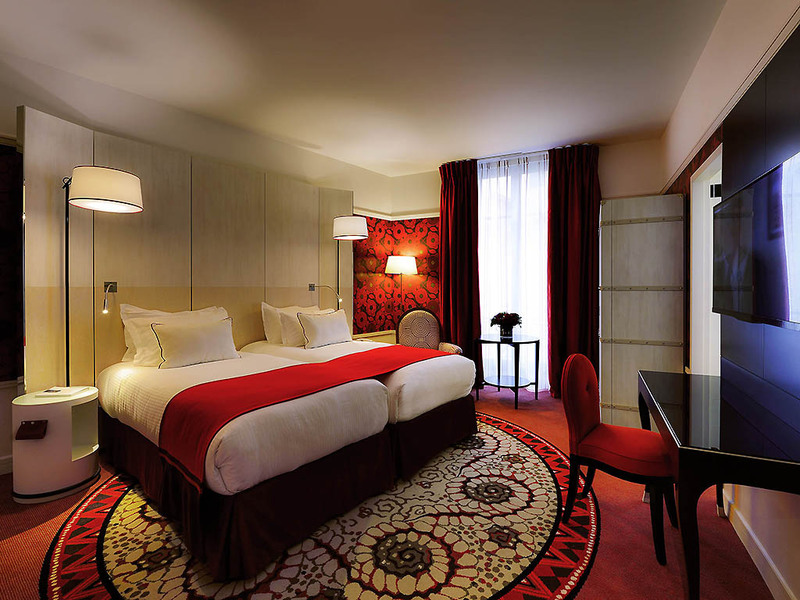 You're sure to enjoy an unforgettable stay at the Hotel Carlton Lyon MGallery by Sofitel! Welcome to the Hotel Carlton Lyon, a timeless jewel in the heart of the city. The greatest chefs, cinema, Fourvière Basilica... Lyons offers all this and much more! We look forward to seeing you at the Carlton for a memorable experience A memorable moment in Lyons.. 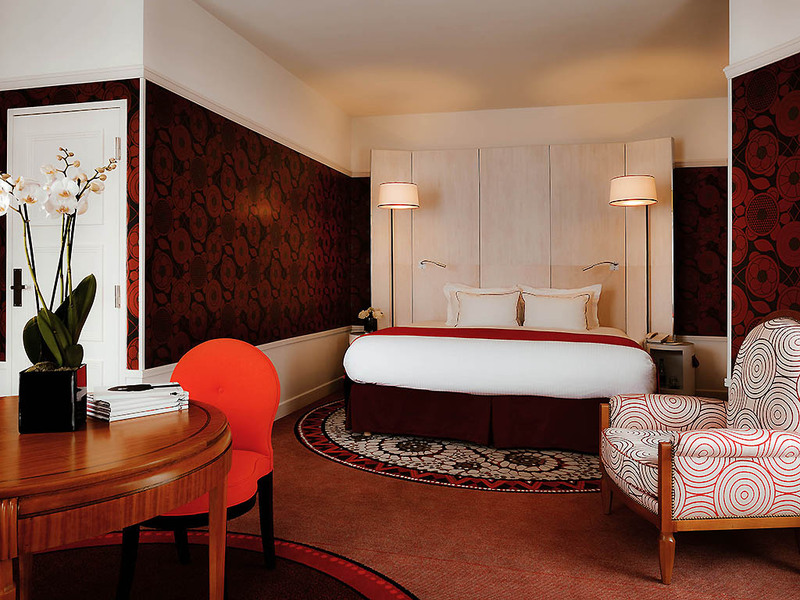 Recently renovated, Carlton Lyon MGallery by Sofitel gleams with renewed splendor. Gather at Le Bar du Carlton for drinks amidst chandeliers, mirrors and ceiling fresco. The nail bar, hammam and "5 Mondes" spa treatment rooms invite you to unwind and revitalize. Take a unique gourmet stroll through Lyons. Our guide will open doors that would be otherwise inaccessible, with artisans selected for the quality of their products. As you enter Lyons, take the Lyon Center exit and follow signs for Presqu'ile, then Place de la République. At the Pont Wilson (Wilson bridge) take Rue Childebert street. The République car park is on this street and it adjoins our hotel. To arrive in front of the hotel, take the first right (Rue Grolée street) then the second left (Rue Jussieu street). Please note that you have to pay to park on all the streets near our hotel. Please use the République car park. 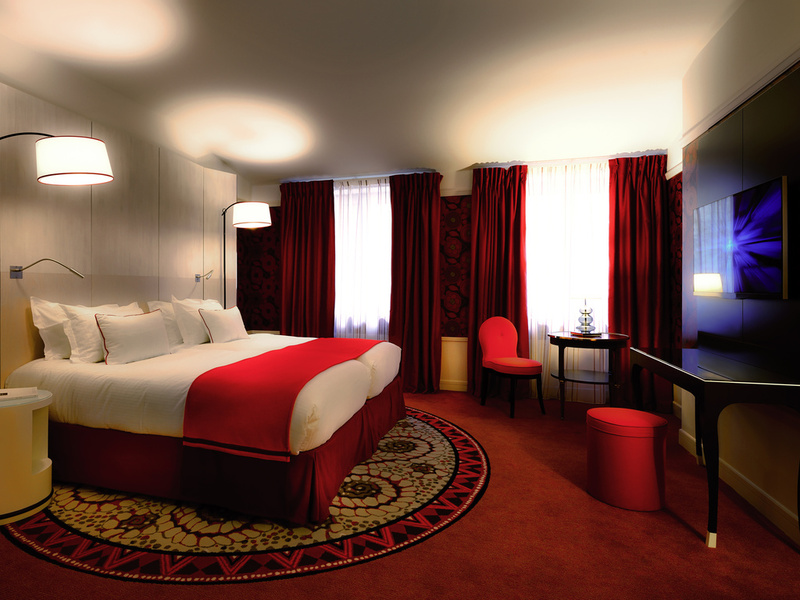 Step into the intimate and sophisticated world of the Carlton's 80 rooms, where red is even used in the unique and original tapestry. The elegant decor combines both the Carlton Lyon's history and a more contemporary style. The rooms are non-smoking. With a freshly brewed espresso in hand, gaze upon Place de la République before sinking into your bathtub, or awaken your senses under the shower. 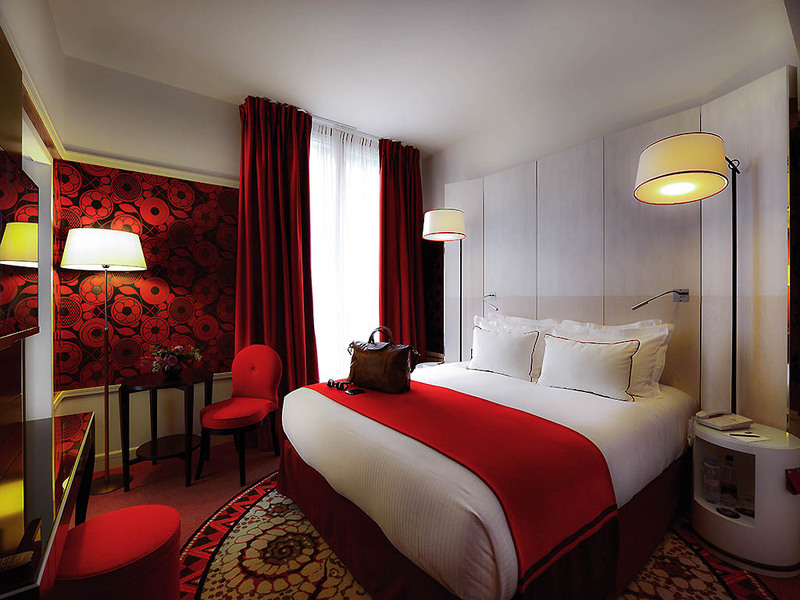 All around you, Carlton's emblematic red décor gives your Junior Suite unmistakable elegance and energy. These Standard Rooms, measuring approx. 194 sq. ft (18 m²), have a king size bed, 42" flat-screen TV, minibar, safe, tea and coffee making facilities, bathroom with bathtub or shower, bathrobe, slippers and hairdryer. These Standard Rooms, measuring approx. 248 sq. ft (23 m²), have twin beds, 42" flat-screen TV, minibar, safe, tea and coffee making facilities, bathroom with bathtub or shower, bathrobe, slippers and hairdryer. These Classic Rooms, measuring approx. 161 sq. ft (15 m²), have a king-size bed, 42" flat-screen TV, minibar, safe, tea and coffee making facilities, bathroom with shower, bathrobe, slippers and hairdryer. Circular Junior Suite measuring 431 sq. ft (40 m²) with a view over the Place de la République, perfect for romantic getaways or family vacations, featuring a double bed, sofa bed, espresso machine, safe, 47" television, bathtub and shower, and bathrobe. Enjoy the cozy atmosphere of the Bar and its signature cocktail, the "Rouge Carlton". In addition to room service the Georges Blanc's "Le Center" brasserie offers innovative cuisine. Le Bar welcomes you with its intimate and cozy ambience. Enjoy one of the various champagnes and cocktails while comfortably seated on its majestic central sofa. Settle into an enticing pale rose banquette that is reminiscent of 19th-century loveseats. The warmth emanating from Le Bar du Carlton invites you to unwind beneath beaded chandeliers. In a nod to the hotel's signature color, Le Rouge Carlton is one of our bartenders' creations. Make yourself comfortable on the majestic sofa that takes pride of place in the middle of the hotel's cozy bar. Sample various champagnes or even indulge in the "Carlton red" cocktail beneath the soft glow of the magnificent pearl chandeliers. Our meeting room boasts natural light, a projection screen and a space for your breaks. It can accommodate up to 12 people in a rectangular layout or 25 in a theater-style layout. Our peaceful lounge offers natural light. We provide an attentive welcome and personalized service for your meetings. A stone's throw from all the city's major attractions, the Hotel Carlton is the ideal starting point for your stay. Please do not hesitate to contact our receptionists who will be delighted to help you to enjoy a memorable stay.